One of the works in this book that I find most fantastic is the statue called Capall Mor, a work done by Tighe O'Donoghue/Ross that is located on the N22 highway near Killarney. Capall Mor appears to be a giant unicorn, rearing its front legs on a cliff near the highway. While it's actually a horse, wearing a spiked battle helmet, the image of the fantastic unicorn persists, with many people even calling the statue "The Unicorn." In this article, you can see pictures of this statue, along with some of Lane's other works from her book, as well as read a bit about how she came to photograph all these statues. 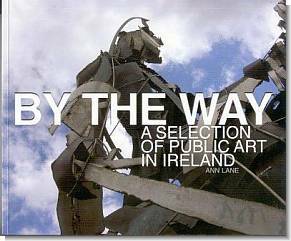 Wikipedia has some information about the public art funding that led to the creation of this sculpture, and this website has pictures of other work by the O'Donoghue/Ross family--including a statue of Merlin, the Faerie Queen, and a sleeping druid. I love the idea of coming around a corner on a road and seeing a giant statue--and the fact that it's the statue of a unicorn, towering over the road below, makes it that much more wonderful.